Chinese immigrants used coins from China, Vietnam and even Japan during their stay in Montana. These coins did not actually have any monetary value, instead they were used for a variety of purposes including good luck charms, gambling tokens and markers, and even served some function during Chinese funerals. Thus, the coins were used far after their originally minting, with some dating back into the 1300s. Archaeologists discover these types of items at sites in Montana and elsewhere in the United States, Canada, Australia, and New Zealand. Unless otherwise noted, all items on this page are in the private collection of Gary Weisz. In addition, all photos on this page are by Gary Weisz. Helpful resource used to identify Chinese coins. 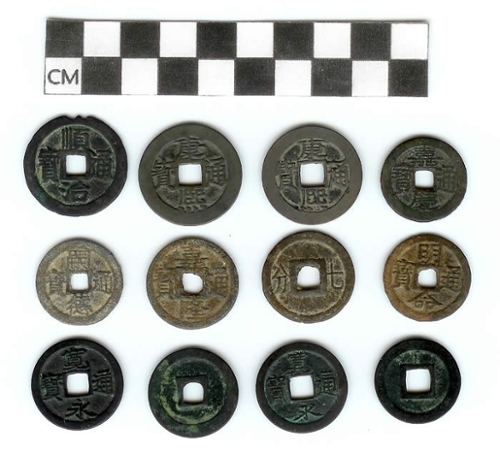 Chinese wen, Vietnamese dong, and Japanese mon found at Chinese archaeological sites along the Northern Pacific Railroad in Montana. Identification of these coins is found below the image. Japanese mon, Bottom Row (unidentified). 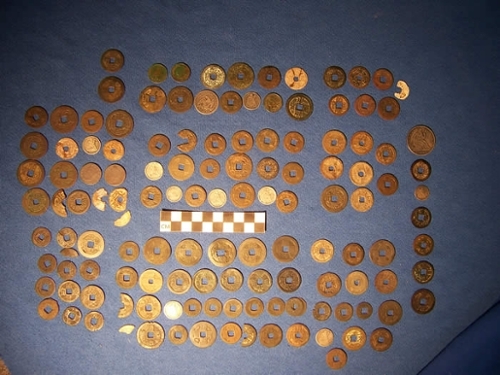 Chinese, Vietnamese, Japanase, Canadian and American coins found on Chinese railroad archaeological sites in Montana and northern Idaho.